Love this! Going to make one as a gift for my favorite audiophile! What white Ikea Kallax shelf did you buy? White or high gloss white? Just white (not high gloss!) Thanks for reading! Hi Mike, thanks for your comment! The legs are 5.5". The exact legs are linked above in the post if that helps! What are the dimensions of the shelves? The IKEA website has the dimensions of the piece as a whole, but not the individual shelves within it. Thanks! Hi Laura! Sorry that it took so long to get back to you! The shelves are about 13x13". They very easily fit a standard 12" record. how many do you think it would hold. I have alot of vinyls! and will it take the weight of them? I love how yours looks!! Hi there! 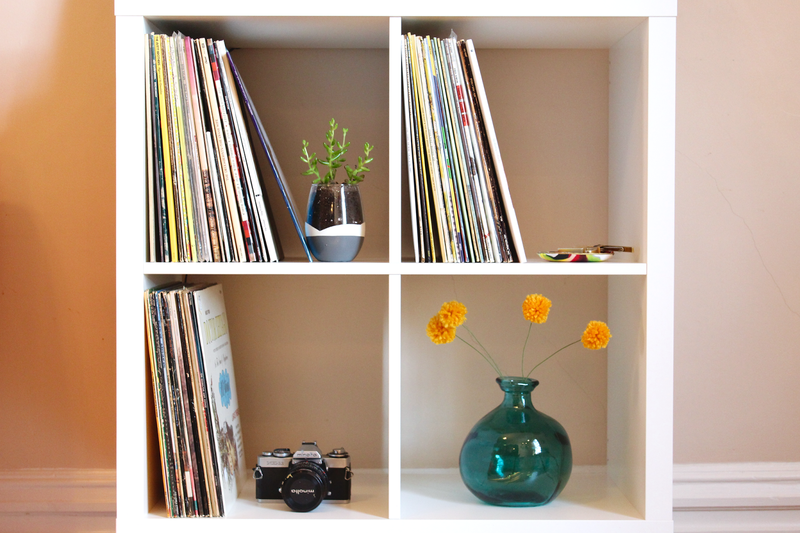 We have about 70 records on ours now (split 35/35 between two shelves). The shelves aren't sagging at all, so I would guess about 200 records? Our shelf feels very secure with 70 records, so I think we will probably run out of space before it would start having issues because of the weight. Thank you for your question! :) Send us a photo if you make one for your home! 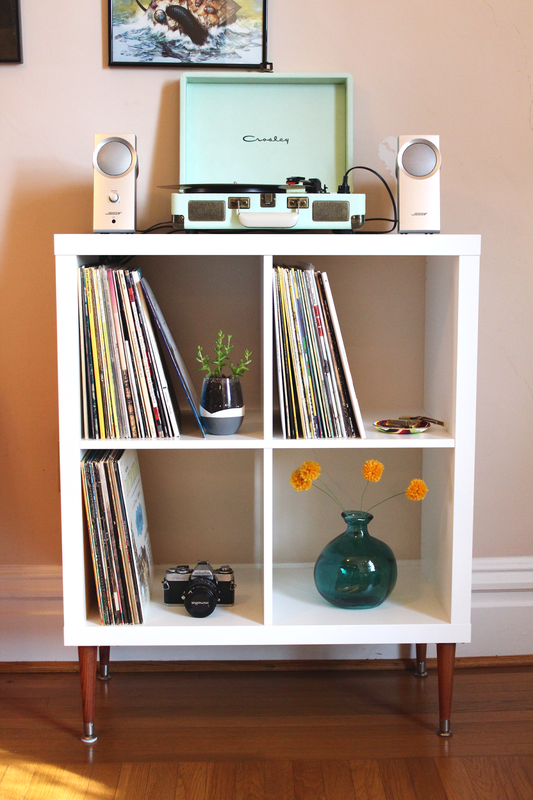 Hi, what speakers do you guys use with your Crosley? I have the same shelf in espresso with a Crosley Cruiser on it, great minds and all that :) I've been trying to figure out what to do with it as I didn't like having it so close to the ground. The legs are a fantastic idea! Hi Barbie! Thank you for your comment! :) We have Bose speakers. I think they're an older version of these (http://amzn.to/2cbEVNz) but they were a hand-me-down from a friend so I don't know much about them. We love them though! On the Crosley we just plugged them into the headphone jack, but we have since gotten rid of the Crosley and upgraded to an Audio Technica, which doesn't have internal speakers at all. 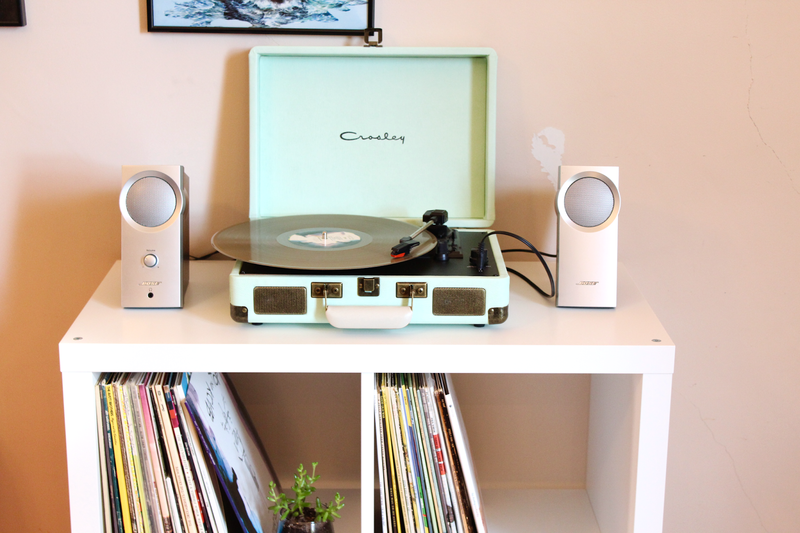 The Audio Technica is in the same price point as the Crosley but has infinitely better sound quality, in our opinion. Best of luck with your system! did screws come with the mounting plate? Yes - the mounting plates come with screws! Hi Jen - thanks for reaching out! I think 6 legs definitely sounds suitable for an 8 cube Kallax. I haven't used the 7.5" Waddell legs, but I find the 5.5" to be very stable. I think if you used 6 legs accommodate for the extra weight, you should be good. Overall, our setup is very stable! 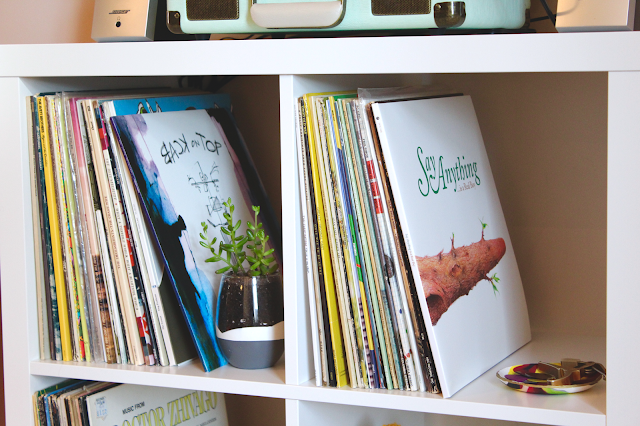 Since the photos in this post were taken, we've gotten a different record player and added a bunch of new records. We haven't seen any signs of instability or sagging. We have about 80 or so records spread out amongst the shelves, but extra knick knacks to style the empty space. Both the unit itself and the legs seem to be supporting the weight very well. I think we'll end up running out of room for more records before we see any issues with support. I hope this helps! Hi there- thanks for the detailed write up on how to put this together. Love the design and I'm currently staining legs for this. I did have someone at the hardware store caution me about screwing mounting plates directly into particleboard, due to the likelihood of it cracking over time. She was recommending a reinforcing layer of plywood between the particleboard and the legs. When you guys drilled in the leg mounting plates, did it feel like the screws got a good solid bite? Have you noticed any increased wobble as you move or load the table over time? Hi Evan! Thanks for reaching out! 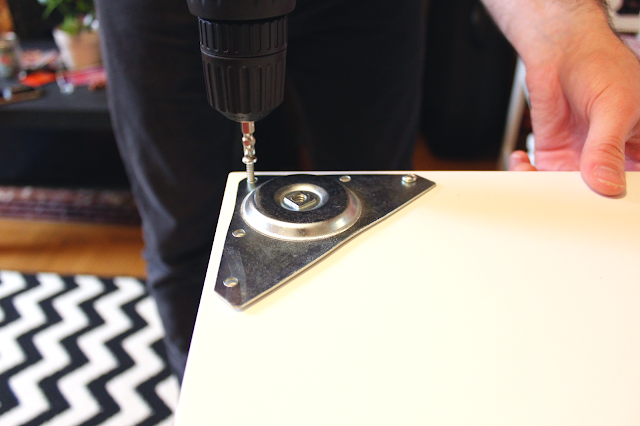 When we drilled the mounting plates into the bottom of the shelf, it definitely felt very secure. 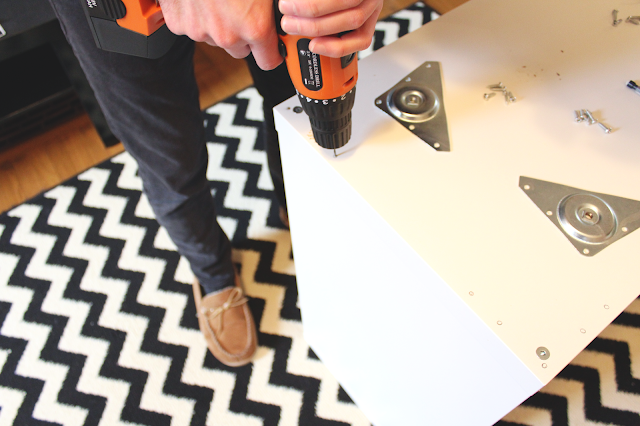 We've had no issues with stability when adding weight or moving the shelf around. Since this post we've moved to a different house, so it got moved around a bunch during that process and we've had no issues. All in all, we think it's very secure and we highly recommend it! Hi John, thanks for your comment! We knew we wanted to use a mid-century style leg for the record stand and I had seen other people use these legs for projects, so we decided to give them a shot. We already had the stain on hand, so that's why we used it, but haven't regretted the decision once. We've never used Danish oil on wood before (but would like to try it sometime!) so it just wasn't something that we would have thought of at the time. Since making the record stand almost a year ago, we've moved to a new house and have not had any issues with knicks in the wood or imperfections with the stain. All in all, no downsides - we really love it! Thanks for the inspiration! My husband bought me a record player and 1 record for my birthday this year, but since we moved 6 months ago and brought 0 furniture with us, we didn't really have a place for it. This was the perfect solution because it doesn't take up a lot of room but still has good storage. We're adding some hairpin legs to it soon. Hi Samantha! That sounds awesome - I'd love to see it! 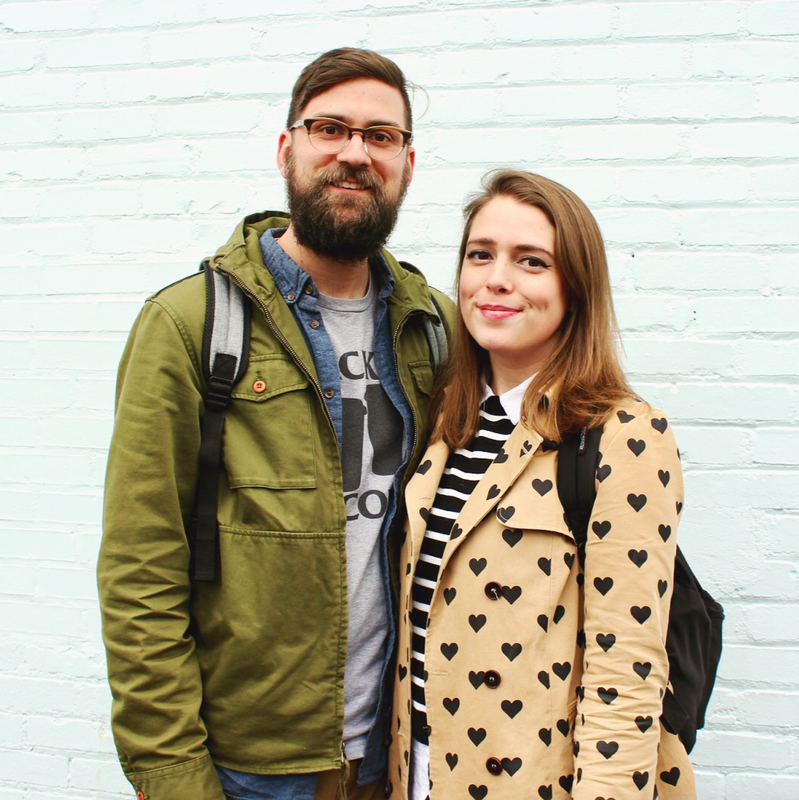 We're big fans of hairpin legs around here too. I love this post! What is the process you used for staining the legs? 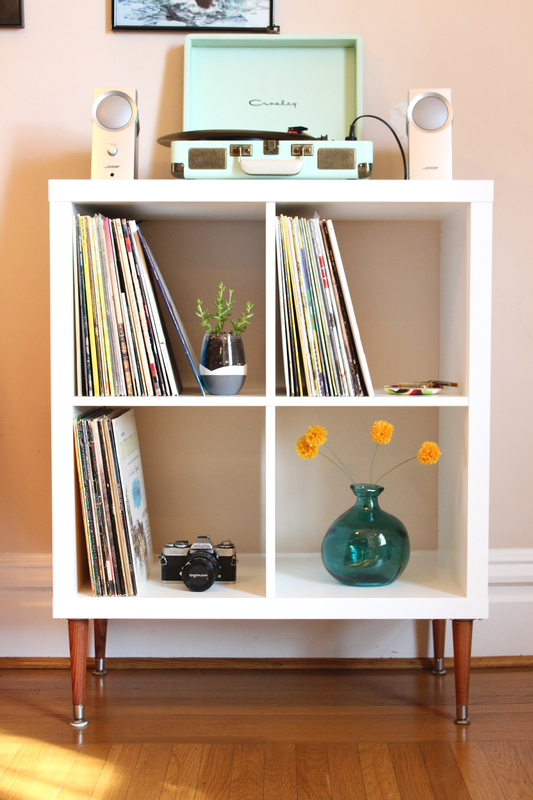 I've been having such a hard time finding a nice stand for my record player. I can't wait to build this. Hi Katherine - thanks for reading! :) We added a small amount of stain to a rag and wiped the legs with it until they were coated evenly. Then we used another dry rag and wiped the excess stain away. Sorry we didn't share any photos of the process, but I hope that helps! If you have a piece of scrap wood lying around, you could test your stain on there first to see how it would work! Hello! My name is Brianne. 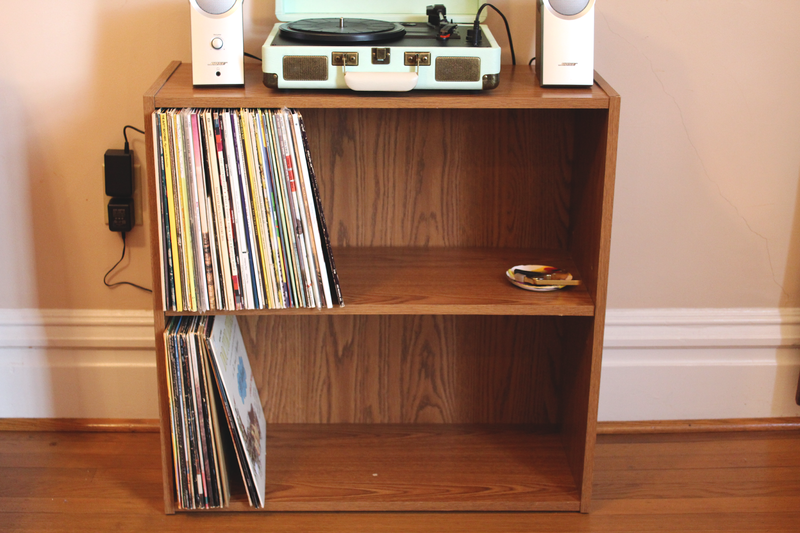 This is an awesome article; I'm currently trying to find a somewhere for my record player and vinyls in my apartment. Would you recommend the kallax shelves? Have they been sturdy for you with the weight of the records/record player. If you could let me know, that would be awesome!Your aesthetic is rad and I appreciate your help. Cheers! Hi..Love your idea. Making this for my daughter for Christmas..but..It looks like from your image that the legs might be the 7.5" They look taller and less squatty than the 5.5 legs you listed. Could you confirm? Sorry..Want it to look just like yours:) Thx! Thanks, Judy! Sorry for the delayed response - I think you're correct, we do have 7.5" legs as opposed to 5.5". We made this record stand several years ago and I'm not sure why we so confidently wrote 5.5", ha. I hope your daughter likes it! Hello Sarah (and Nick)! I love this idea. I am thinking about doing a similar project with the Target Threshold 6 cube. Do you think the weight will need 6 legs for support of just 4? Just curious.